Formal methods are becoming increasingly important for debugging and verifying hardware and software systems, whose current complexity makes the traditional approaches based on testing increasingly-less adequate. One of the most promising research directions in formal verification is based on the exploitation of Satisfiability Modulo Theories (SMT) solvers. 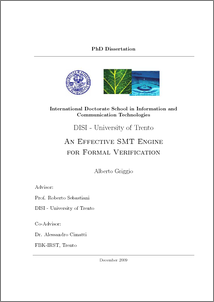 In this thesis, we present MathSAT, a modern, efficient SMT solver that provides several important functionalities, and can be used as a workhorse engine in formal verification. We develop novel algorithms for two functionalities which are very important in verification -- the extraction of unsatisfiable cores and the generation of Craig interpolants in SMT -- that significantly advance the state of the art, taking full advantage of modern SMT techniques. Moreover, in order to demonstrate the usefulness and potential of SMT in verification, we develop a novel technique for software model checking, that fully exploits the power and functionalities of the SMT engine, showing that this leads to significant improvements in performance.